Here at Discover Towns we’ve noticed a trend toward people and dogs travelling together. So we’re looking round for pet friendly places visit and stay with your best friend. People tell us that taking their dog with them on a visit is a happier option than telling it that you will be back in a few days. So we’re looking around for towns that put out the dog bowl at attractions and events, and say well done to Warwickshire, leading the pack on the doggy walk. Plenty of dog friendly places in Shakespeare’s England! Warwickshire is home to the world’s most famous playwright, majestic Castles, unique heritage, great theatre, culture and glorious gardens. Here, Shakespeare’s England offers everything for a short break including a range of pet-friendly places to visit, eat and stay! 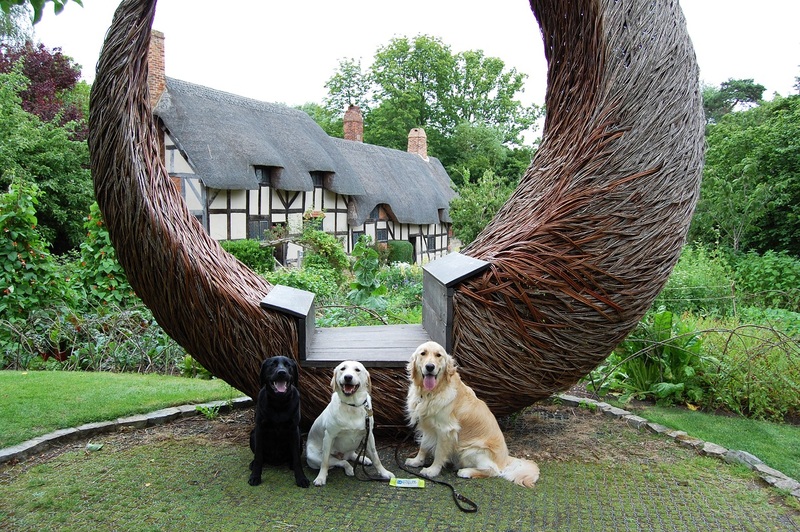 The Shakespeare Birthplace Trust allows dogs in the grounds of Shakespeare’s Birthplace, Hall’s Croft, Shakespeare’s New Place and Anne Hathaway’s cottage (except Mary Arden’s Farm due to livestock). Take part in “Shakespaw’s Day” on 25 August at Anne Hathaway’s cottage when visitors can bring a picnic and enjoy the dog show. Categories include waggiest tail and best recall, plus there are prizes and rosettes. Visitors also receive 30% off single house tickets when they bring their pooch. Enjoy a guided tour of Stratford-upon-Avon with Stratford Town walk and Ghost Walk which also welcomes dogs. Kenilworth Castle also accepts dogs on leads and there are plenty of places where dogs can ‘lap up heritage’. Water bowls are available outside the visitor centre and tea-room. Dogs are also permitted on the Warwick and Stratford Trivia Trails. Please note one team member will have to wait outside with their four-legged friend while the others look for answers. Bicester Village now offers four pet strollers for guests with dogs. However, it is down to the discretion of each boutique whether they allow the stroller in the store. Fargo Village in Coventry welcomes dogs in the majority of their shops including Backhaus, the onsite coffee shop/café. They even have a doggie boutique selling treats, clothing, bandana’s and pet beds! Fargo also hosts a Dog Show in aid of Sukis Canine Rescue on 28 May. Free admission into the village but a small charge per class to enter the dog show. The Stratford Hotel has recently become a dog friendly venue and provides beds, bowls & treats. There is a supplement of £20 per room per night. The Mercure Shakespeare Hotel also welcomes dogs and can supply a small dog cushion or slightly larger doggy bed! Cost is £10 per dog per night. The hotel hosted 5 four-legged guests over Christmas so is a popular choice! Chesford Grange near Kenilworth is dog friendly and charges a small supplement. Some bedrooms have patio doors that open directly onto the grounds, ideal for an early morning walk. Adelphi Guest House in Stratford also accepts dogs in their ground floor room which has its own patio and side entrance. Cost is £10 per night per dog. Blankets and bowls are also provided. Peach Pubs which operates The Almanack in Kenilworth, The Rose & Crown in Warwick and The One Elm in Stratford permit dogs in their bar areas and always have treats for well-behaved pooches. The Globe in Warwick also permits dogs into its bar area and provides treats. Some bedrooms on the ground floor are dog friendly and charge £20 per dog. The Bell at Alderminster welcomes well behaved dogs in the bar and provides dog bowls and treats behind the bar. Often on a Saturday in shoot season the number of dogs in the bar outnumbers humans! Hathaway’s Tea Rooms in Stratford-upon-Avon also has a dog friendly garden and Susie’s Café Bar at The Other Place (Royal Shakespeare Company) welcomes dogs and provides treats! Dogs are also very welcome at The Fleece Inn in the pub and in the bedrooms. Surrounded by countryside and in the beautiful village of Bretforton near Evesham, customers can enjoy a walk then relax with a drink. 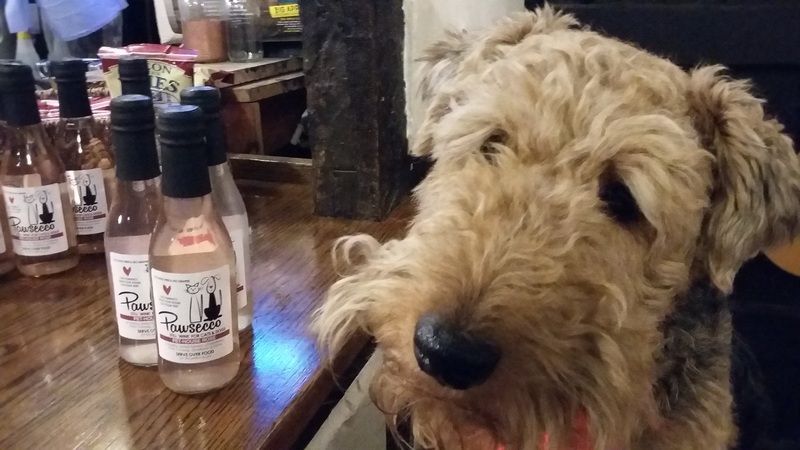 The pub offers free dog treats and sells locally made Pont & Pierce treats, Pawsecco and Dog Beer. Previous PostChertsey on the Thames had some of the finest medieval floor tiles in England. Next PostReigate Heath Windmill church is possibly the only windmill that is a consecrated church in England.